What is the Home Flood Protection Program? 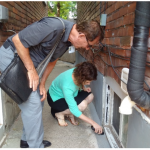 The Home Flood Protection Program is a residential flood risk reduction education program that was launched by the Intact Centre on Climate Adaptation at the University of Waterloo in 2016. The goals of the Home Flood Protection Program are to help residents take action to reduce their flood risk and reduce damage in the event of a flood. From 2016-2018 the Intact Centre developed and tested a nationally applicable home flood risk assessment tool. 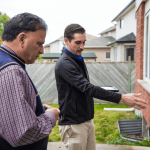 Over 500 Home Flood Protection Assessments were completed by the contracted delivery agent, AET Group, in Burlington and Toronto, Ontario as well as Saskatoon, Saskatchewan. Confidential data analysis from assessment reports and participants’ follow-up surveys has provided critical insights into the top flood risks at homes, key actions taken to reduce risk after an assessment, barriers to taking action and opportunities to drive additional action to reduce flood risk. 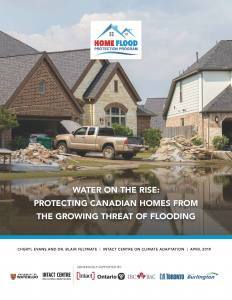 For a summary of the program results please see the report, Water on the Rise: Protecting Canadian Homes from the Growing Threat of Flooding, or read the one page infographic which summarizes the key findings. Intense rainfall events combined with aging municipal infrastructure, increased urbanization and a lack of flood protection measures at the household level have resulted in losses in billions of dollars for Canada’s insurance companies, governments, homeowners, landlords and tenants over the past decade. 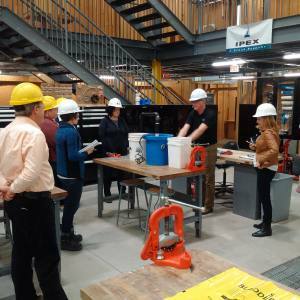 The Intact Centre has developed a variety of resources to help Canadians take action to reduce their basement flood risk. The University of Waterloo is no longer directly engaged in the coordination of community-based flood risk assessment programs. However, residents can still access home flood risk assessment services through private service providers. ✔ Home Flood Risk Assessment software is being made available to successful graduates of the College Home Flood Risk Assessment training course. A list of successful graduates by province is under development. If you have questions or feedback about the Home Flood Protection Program or a flood-related story to share, contact Program Specialist, Daniel Filippi (daniel.filippi@uwaterloo.ca).